Doors give entrance to spaces and as such they have a practical function. They also form the connection between two spaces, between inside and outside (sometimes literally, sometimes inside in one space and outside in the other) and thus other meanings appear, in particular those of a ritual nature: going from one space to another can also be interpreted metaphorically as a rite de passage, as a transition between two stages of life, an element in the search for knowledge and finding fulfilment. Jasper Niens‘ work 5 ROOMS, which was specially created for Nada Miami (previous works by his hand were for instance shown at the Haags Gemeentemuseum and on the Art Forum Berlin 09), provides the observer with the opportunity – using several doors – to enter four different spaces that are all connected to at least one other space. These spaces are all empty; there is nothing to be seen. Usually spaces have a function, but these spaces are consciously functionless and every passage, every rite de passage, seems to lead from nothing to nowhere. There is no obligatory or preferable walking route, nothing is fixed. When going from one space to another, we expect to find something over there, and at an art fair that could for instance be one or more works of art, but there is no response to that expectation. That conjures up the idea that the architecture itself could be the work of art and that is partly true. I would say that the architecture, including the doors, creates the conditions for a work of art, and that the actual work is partly brought about due to the contributions of the visitor (as in fact every work of art only becomes a work of art when it is communicated, when there is an observer). Then the meaning shifts and the experience of the spaces and the behaviour of the visitor in the whole become the actual complete work. In that case, it is not so much about empty spaces or about emptiness in general, but rather about breaking away from expectancies, the spontaneous choreography of the visitor’s movements through the space – which may vary per visitor – and in the end maybe again nevertheless about emptiness, about visual, conceptual and spiritual emptiness that can be outlined by association to one’s own discretion, but maybe also makes clear that in the end – even at an art fair with a huge amount of the most varied forms of art – nothing is reality except for the labyrinthian, subjective experience, the personal reaction to the environment. To that extent, this work is also a statement about its own context and environment, with which it holds an ambivalent relationship. There where almost ‘everything’ is shown, ‘nothing’ – the emptiness – takes on a polemic meaning: he who wants to see everything cannot concentrate on anything properly and mainly experiences sensory confusion, mitigated by cognitive recognition and reassurance. In this work by Niens, where one sees nothing, the visitor is wrongfooted: there are hardly any sensory stimuli, nothing happens and there is no such thing as recognition, as ‘nothing’ is not recognised. One could persist in saying that it cannot even be ‘known’, but it can certainly be perceived and that is an eye-opening experience at this place. But this deprivation could also evoke an experience of peace, of silence and all this even in various spaces that only slightly differ from each other in size. The repetitiveness of emptiness, wherever you turn to or stand in this work, reinforces this feeling. Varying from sensory and cognitive confusion to pure spirituality, this work can evoke almost anything that induces reflections on art, context and one’s own behaviour. In that sense, Niens’ work is confrontational and that applies to his complete oeuvre, which addresses and questions the daily conventions of experiences and behaviour in ever changing ways, so that it becomes obvious that what we consider to be a given, is in effect not necessarily a matter of course. In a previous work, the visitor had to enter a notch in a massive wooden construction on wheels that was too heavy to be moved by one person: thus the observer became dependant on the goodwill of others to help push the monstrous thing, otherwise he could not get to the other side of the room. 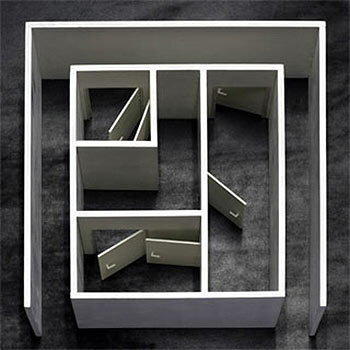 In another work, the visitor had to walk through a high, claustrophobic narrow corridor and turn a few right-angled corners before he, filled with expectations, found himself in an empty square room. This sort of work is, just like the present one, of an almost eastern character: we go to a lot of trouble to get somewhere, and when we arrive over there it turns out there is nothing, the all-encompassing nothing that – precisely when something is strived for, when a lot of effort has been put into something – may be both eye-opening and liberating, and generate a reflection about life as a path on the way to what was always there (or was not there in the first place, that duality is now surpassed) but was never recognised.